Either the 8054 or the 10072 is needed to power the system. The 8054 is a rechargeable, 12 V, 12 Ah battery that can power an ALERT system. Either the 10072 or the 8054 is needed to power the system. The 10072 is a rechargeable, 12 V, 24 Ah battery that can power an ALERT system. The 31182 is a magnetic mount GPS patch antenna. It is typically used where GPS reception is readily available and concern is low for snow buildup completely covering the antenna. The 31182 is also commonly used in cost-sensitive applications or applications that require a small-sized, low-profile antenna. This antenna connects to a GPS receiver with SMA connector. The antenna package is waterproof and corrosion resistant. 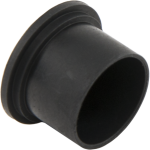 The 17992 GPS antenna is both jam resistant and submersible for greater reliability under field conditions. It requires a 18017 antenna cable and mounting hardware (7623 pipe, CM202-series crossarm, and CM220 or NU-RAIL connector). The 30626 is an antenna mounting bracket designed for antennas with 3/4 in. IPS mounting threads. Because the 30626 is made from steel, it is suitable for mounting small magnetic-mount antennas typically seen with GPS patch antennas. The AL200 is an ALERT2 encoder and modulator that provides ALERT2 and ALERT-concentration services. With integrated sensor inputs, the AL200 allows you to create a minimal ALERT2 transmitter/station, decreasing the cost of a typical flood-warning system. The 7843 is the 2-pin, power supply connector (green) supplied with the ALERT210. This detachable plug can be easily replaced by the user. The 28750 is a replacement connector for the AL200. The 10873 is a serial cable that is useful for connecting the RS-232 port of the datalogger to the 9-pin RS-232 port of a computer. The cable is six feet long.